The Berlin suburb of Babelsburg was home to Germany’s pre-war ‘Hollywood’ and its leading production company Universum Film AG (Ufa) which, at its height was producing some 500 films a year. 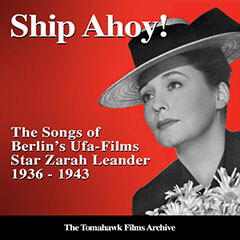 With the advent of the Third Reich in 1933 Ufa came under increasing state control and by 1942 was wholly Reich owned with the most popular female star on its books being the popular Swedish singer & actress Zarah Leander who, born, Zarah Stina Heberg in Karlstad in 1907, had originally been a star of Sweden’s ‘silver screen’ in the early 30s. Early on, a Hollywood film career had beckoned, but newly divorced with two small children, she stayed in Europe and, fluent in German, looked to the Third Reich where, in 1936, she eventually she was rewarded with a Ufa movie contract, but known as a tough negotiator she demanded huge salaries, paid in Swedish Kroner, much to Propagandaminister Goebbels’ annoyance, who dubbed her an "Enemy of Germany". However, as a musical movie star much loved by Adolf Hitler and a performer in ten of Ufa’s most successful films, her career in Nazi Germany flourished playing the role of a Femme Fatale...independently minded, beautiful, passionate and self-confident, all of which she was in real life! Her singing voice had a smokey, deep, intensity more in-keeping with that of her early rival Marlene Dietrich, however in 1943 Zarah's villa in the fashionable Berlin suburb of Greunwald was hit during an air-raid and, combined with continued Nazi pressure to apply for German citizenship, she chose to return to Sweden after her film 1943 movie ‘Damals’. But following Germany’s defeat at Stalingrad, neutral-Swedish opinion turned to sympathy for the Allies and Zarah, so directly linked with Nazi Propaganda, was shunned in her home country. Reite, kleiner Reiter - Ich steh’im Regen - Schiff ahoi - Mein Leben fűr die Liebe-jawohl! - Der Wind hat mir ein Lied erzählt - Merci, mon ami -Heut' abend lad' ich mir die Liebe ein and Yes Sir!